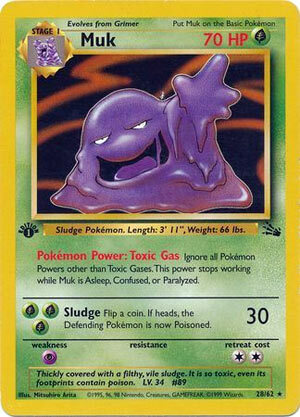 Today’s Throwback Thursdays goes all the way back to the original series with Muk from Fossil Set! This is the Pokémon that started what we would call it ability denial. The wording may be different since it says, but it effectively shuts down all Pokemon Powers, much like how Garbodor’s Garbotoxin shuts off all abilities. Like Garbodor, Muk’s Pokemon Power can be played around; it goes offline if Muk is Asleep, Confused, or Paralyzed. Garbodor needs Pokemon Tools to go online. All in all, this Pokemon Power is very good. It also has 70 HP, which is actually better than average in its time, since HP capped at 120 HP; Chansey and Charizard possesses that much HP, most other Stage 2s have around 70-100 HP. This is enough that in case someone tries to OHKO Muk, they’ll have to be almost fully set up to do 70 damage, and not many cards can do that much damage. Even if it did, it would have costed 4 energies, and even has drawbacks or being luck dependent. So Muk can stay in the game much longer than modern day Garbodor. Muk isn’t good enough to be an attacker because it’s only attack costs GGG for 30 damage and a 50% chance to poison. The retreat cost of 2 means a DCE can easily pay to retreat should Muk be even stuck in the Active. If it were to be reprinted, it would replace Garbodor in every aspect of it was given the ability to shut down Abilities without restrictions or drawbacks, albeit be affected by Special Conditions to make Toxic Gas go offline. Also give it around 130-220 HP, and Muk can stay in the board longer. Wishful thinking, but Alolan Muk from Sun & Moon did a similar job against Basic Pokémon, so that’s like 50% of the original Muk. We’ve taken a bigger look at recent rainbow-colored variations of Muk, but now it’s time to look at an OG Muk – from an OG set! In fact this is the very first Muk card ever printed back in the Fossil set, and it’s a real doozy! Muk is a Stage 1 Grass Pokemon, 70 HP, with a Psychic Weakness, no Resistance, and a Retreat Cost of 2. Toxic Gas is something you don’t want coming your way, since it’ll completely shut down any other Poke-Power that isn’t Toxic Gas. Fortunately, if you inflict Muk with Paralysis, Sleep, or Confusion, the Power will shut down too. Sludge then is a brutal 3-for-30 that lets you flip a coin, and if it lands on Heads, you get to Poison the opponent’s Active Pokemon. Now they’re covered in a miasma of Toxic Gas and coated with Sludge that Poisons them! …yeah, by today’s standards, Muk is extremely powerful in some contexts and horrendously weak in others. An updated Muk in today’s game would be made more similar to how Alolan Muk (SM) was made, with Power of Alchemy shutting down the Abilities of Basic Pokemon in various areas and unable to be turned off itself except by another Ability or effect. Sludge would also have to deal at least 80 damage and automatically Poison to see any amount of play, but Toxic Gas would likely be made good enough to make sure Sludge wouldn’t be necessary by shutting down all other Abilities and keeping some sort of limiter on Muk so it doesn’t completely overcentralize the game around itself. Oh, and make it a Psychic Type. Cause they made Poison Pokemon go Psychic for some reason or other. Abilities in this day and age are much more prominent than Poke-Powers used to be back in Muk’s time, and Evolutions weren’t as utilized when you could instead play big Basics who had comparable HP to what Muk has, as well as the ability to hit harder faster. Back in Fossil’s meta, Muk was generally too slow and inefficient to utilize compared to cards like Hitmonchan and Electabuzz, even though in today’s updated game he’d likely see a lot of play to shut down tons of Abilities. Similar Abilities like Garbodor’s Garbotoxin and Wobbuffet’s Bide Barricade saw some competitive usage at some point in their lifespan in the Standard game, and Muk would likely have some time in the spotlight himself. So in the case that you might be wondering where Pokemon similar to Muk have gotten their crazy Abilities to shut down…well, other Abilities, look no further than the first Muk ever made! Arora Notealus: One of the noteworthy advantages Muk would have in today’s game is the same as any other Muk – Ditto <Prism>! With its Ability to substitute as any other Basic for any Stage 1 Pokemon, it could make Muk see a lot of widespread play. It would likely make Muk more popular than Garbodor, since it wouldn’t need a Tool attached to trigger his Ability that shuts down other Abilities – including Ditto <Prism>’s Ability itself! Next Time: Speaking of Pokemon in today’s game with powerful Abilities…and Stage 1-ness. Since we looked at an Alolan Grimer, followed by an Alolan Muk, the obvious Throwback pick would, of course, be the original Alolan Muk (Sun & Moon 58/149) as its usage has really stepped up since it released two years ago. It isn’t like we’ve looked at it since about month after its release, either. I did not think of that as I was trying to quickly come up with a pick for today, so I just went back as far as I could go for Muk-related cards, to the beginning: Muk (Fossil 13/62, 28/62; Legendary Collection 16/110). We’ve reviewed it only once before, around the time it was reprinted in the Legendary Collection, an all-reprint set put out by Wizards of the Coast after the Neo sets but before the e-card series. The Legendary Collection was seen as unusual at the time because it was a reprint set the players really liked, unlike the game’s first reprint set (Base Set 2). Relevant to competitive TCG play, this last printing of Muk made it legal for the last few weeks of 2001-2002 and the entirety of the 2002-2003 Standard Formats. Note that the Standard Format was referred to as the “Modified Format” at the time. Muk is a [G] Type Pokémon because the Poison-Type was originally part of the TCG Grass (or [G]) Type and not the TCG Psychic (or [P]) Type. The Typing didn’t mean much, anyway, because (spoiler) this Muk wasn’t often used to attack and by the time we had competitive [G] Type support, I’m pretty sure Muk was long gone from Modified (what we now call “Standard”) Format play. The same for if we had any anti-[G] effects. Being a Stage 1 wasn’t as good as being a Basic (the best Stage at the time), but not by a huge margin. I could be mistaken because this time period was heavily skewed by some of the strongest Trainer cards ever released, and Pokémon that wouldn’t be overtaken by power creep for around a decade. 70 HP was the “magic number” for Basic Pokémon back in the day, and still good for a Stage 1. Why? The short version is that the highest-profile competitive decks of the day struggled to rapidly, reliably, and repeatedly OHKO that amount. If I remember correctly, the best you could hope for was two of the three. The exception being decks with a strong, Psychic attacker, due to the cards [P] Weakness. The lack of Resistance was less common back then, but still pretty much a non-issue. The Retreat Cost of [CC] wasn’t good, but neither was it bad. Muk has one non-attack effect and a single attack. “Toxic Gas” is a Pokémon Power, which I’ll explain in more detail shortly. Toxic Gas states you are to ignore all other Pokémon Powers in play, besides other instances of Toxic Gas, and that it stops working while Muk is Asleep, Confused, or Paralyzed… unless you’re looking at the final printing of the card from the Legendary Collection, where it says any Special Condition shuts off Toxic Gas. Neo Destiny (February 2002) is the set prior to the Legendary Collection (May 2002). Sometime in between there, it was ruled that all the Pokémon Powers that used to be shut off by just Confusion, Paralysis, and Sleep were now stopped by Poison as well. We also learned that they’d collectively be known as “Special Conditions” starting with the cards in the Legendary Collection. Burn would join the original four Special Conditions when it was introduced in Expedition (September 2002). Now… what’s a Pokémon Power? So Muk’s Toxic Gas doesn’t just stop cards effects labeled as Pokémon Powers, but those labeled as Poké-Bodies or Poké-Powers, while any effect that states it applies to both Poké-Bodies and Poké-Powers – but not those that only affect one or the other – will work on the original Pokémon Powers. Toxic Gas is actually one of the reasons these effects were later split up; shutting down all Pokémon Powers, just like shutting down all Abilities, was very good! Muk also knows the attack “Sludge”, which it can use for [GGG] to do 30 damage and – with a successful coin flip – Poison your opponent’s Active. While damage output and HP scores were lower back in the day, this was an underwhelming attack even back then because it was difficult to attach three Energy to a Pokémon without Energy acceleration and not only was there no competitive [G] Energy acceleration, anything that came close was a Pokémon Power Toxic Gas would disable. In its day, Muk wasn’t part of the dominant archetype, but it was part of competitive decks, even in the earliest days of the game. There are many older Evolution cards where players claim it was competitive but the evidence is wanting; card scarcity and lack of player knowledge or skill allowed such decks to seem competitive when they otherwise wouldn’t have been. Muk is not one of those Pokémon. While only a few Pokémon Powers were worth building a competitive deck around back then, besides the many not-quite-competitive lists that did focus on a Pokémon Power, you had potent Basic or Stage 1 cards with useful Pokémon Powers, like Ditto (Fossil 3/62, 18/62). Regrettably, I still don’t know much about competitive play during the time when Muk’s final printing was legal. I do know that it was a solid pull in the Limited Format back then; its stats and attack are better here, though your deck will have to run on mostly [G] Energy. Even if you’re not, Toxic Gas is very tempting as the few decks with Pokémon Powers are probably counting on them; as with almost everything else, even weaker Pokémon Powers tend to be good in the Limited Format. Muk was a very influential card; while it hasn’t been reprinted since the Legendary Collection, many modern cards have been inspired by it. Two and a half relevant to the competitive metagame are Alolan Muk (Sun & Moon 58/149), Garbodor (BW – Dragons Exalted 54/124; BW – Plasma 119/116; BW – Legendary Collection 68/113) and Garbodor (XY – BREAKpoint 57/122). Two and a half? Alolan Muk has the Ability “Power of Alchemy” that states we ignore Abilities on Basic Pokémon while both Garbodor have the Ability “Garbotoxin”, which causes all other Abilities to be ignored but requires Garbodor have a Tool attached to itself. Garbodor (XY – BREAKpoint 57/122) is not a reprint of the older Garbodor, but the differences between the two don’t matter when it comes to competitive play, so I’m not going to treat them as two totally distinct examples. Alolan Muk nor the Garbodors have the raw stopping power of the original Muk, but that’s on purpose. The game’s designers seem to want us using more Abilities, but if they’d been like the original Muk – substituting Abilities for Pokémon Powers – we’d have a very different present and recent past. It is hard to imagine Ability-usage remaining high in the face of that; stuff you burn through on your first turn would probably still be widely played, but you’d have to write them off after that unless your opponent had one of the few other Abilities worth using because of how easy those Stage 1 lines would be to run in a deck. Even a near reprint of Muk, only changing Toxic Gas into an Ability that turns off Abilities and its [G] Typing to [P] would be nasty because of how much we rely on Abilities in the present. If you never experienced Muk firsthand, it is an important card to know about due to its historical performance, as well as how its influence is still being felt today with how certain cards are designed.